The Colonial’s cuisine has been inspired by North Indian flavours derivative of the British-Colonial rule, a period that gave rise to a rustic and robust fusion of eastern spices and western cuisine. The Colonial British Indian Cuisine offers more than just sit-down dinner service; there’s easy online ordering for home delivery or pick up, plus you’ll find a range of competitions and special offers for members to enjoy including a free birthday meal when you join The Colonial Curry Club. The Colonial is unlike any other Indian restaurant. Being involved in various fundraising community projects including working closely with local public schools to help raise funds for much needed educational facility upgrades. 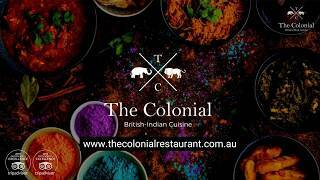 Experience The Colonial British Indian Restaurants for Sydney's favourite Indian cuisine.